In April, after attending a round table to discuss collaborative conservation in Armenia, Charlotte Beckham, Conservation Development Assistant at World Land Trust (WLT), visited the Caucasus Wildlife Refuge. My wildlife watching during a site visit to the Caucasus Wildlife Refuge (CWR) did not start well. On arrival at the ranger station in the refuge I made an embarrassing spectacle of myself. As the rangers gamely pointed out their horses on the mountains directly in front of me, I’m ashamed to say I couldn’t actually see them. If I couldn’t see their horses, what hope did I have of spotting species of wildlife perfectly adapted to the vast landscape of the Caucasus? The Bezoar Goat, for example, is superbly camouflaged to avoid detection by its main predator, the Caucasian Leopard. But that same day, just as I was beginning to lose heart, I started to see some of the fantastic bird life in the area. We were travelling through the Khosrov Forest State Reserve – 60,346 acres of protected area (24,422 hectares) adjoining the CWR – and saw Griffin Vulture (Gyps fulvus), Eurasian Black Vulture (Aegypius monachus) and Bearded Vulture also known as Lammergeier (Gypaetus barbatus), all within the space of half an hour. By the end of the day I had added European Roller (Coracias garrulus), Red-billed Chough (Pyrrhocorax pyrrhocorax), European Blue Rock Thrush (Monticola solitarius) and Hoopoe (Upupa epops) to the list. The following morning, I set out with more confidence. Trekking through the heart of the Caucasus Wildlife Refuge, I was starting to see more and more signs of biodiversity, albeit mainly thanks to the watchful eyes of FPWC’s rangers. 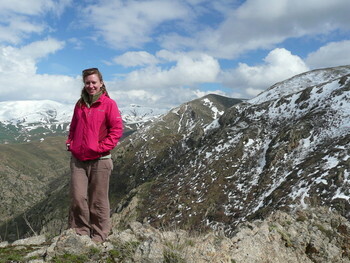 The trek took us high into the steep slopes of the mountains of the South Caucasus. While I was doing my best to stay upright (and breathing) at an altitude of over 2,500m, the rangers were following footprints in the snow, and noticing all the rocks that had been turned over; both signs of the rare subspecies of Syrian Brown Bear (Ursus arctos syriacus). Old nest sites of vultures and eagles were the next sightings, and then finally, in the valley below us, we spotted Bezoar Goats, a native species of wild goat threatened by poaching but increasing in number at the reserve. On our route back towards the rangers’ station we checked camera-traps, supplied by WLT, which FPWC use to monitor wildlife on the reserve. The cameras’ memory cards revealed several sequences of Bezoar goats walking the trails. Camera-traps are an essential tool in FPWC’s management of the Caucasus Wildlife Refuge. They help rangers monitor both the wildlife and human activity in the reserve and provide valuable data to inform strategies to protect wildlife in the area. For WLT, camera traps also have a useful role in fundraising, helping us and potential donors to visualise the habitat and wildlife we are helping to protect. Positioning a camera-trap is of paramount importance if it is going to snap wildlife in its view. Proximity to animal pathways, tracks and signs, are deciding factors and reserve rangers are always on the lookout for evidence of animal trails through snow and grass. In the Caucasus Wildlife Refuge, cameras are positioned within a few hours walk of the main research station. Rangers check cameras whenever they pass them on routine patrols, so most are inspected every few days. Cameras positioned above the snowline in winter are moved down the mountainside in the spring after the snow has melted. The cameras are easy to use and footage can be viewed in situ on a small screen on the camera. When checking the footage, there is always a moment of heart-racing anticipation to see what has been captured in the past few days and knowing you might be the first person to see something! 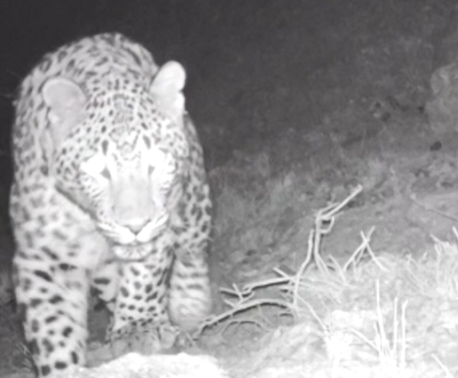 After checking the cameras we continued on, traversing different habitats, from high alpine meadows to rocky gorges filled with native almond, apricot and juniper trees. In this habitat, the floral diversity is striking. What at first sight seemed little more than grass underfoot would invariably turn out to be one of dozens of plants not yet in flower, many of which the rangers informed me are either endemic or threatened in Armenia (or both). In the Caucasus Wildlife Refuge, the rangers’ role goes beyond simply monitoring wildlife. During my visit we stopped to speak to a cattle farmer and herb collectors on the boundary of the protected area. Everyone was happy to talk with the rangers and all were aware of the CWR and its remit. And, on a separate occasion, after meeting the mayor and other members of the Urtsadzor community, it was clear that they too were all pleased to be involved in the project. They talked supportively about FPWC’s impact on the area and clearly enjoyed seeing the increased wildlife within the Caucasus Wildlife Refuge. Which all goes to show that the good and dedicated work of FPWC’s rangers is making a real difference to wildlife and conservation in Armenia. 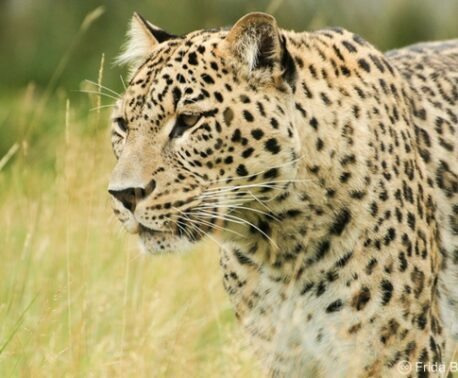 Charlotte made a two-day visit to the Caucasus Wildlife Refuge in April 2013. She was accompanied by Manuk Manukyan and Gor Hovhannisyan, two rangers supported by World Land Trust’s Keepers of the Wild programme. 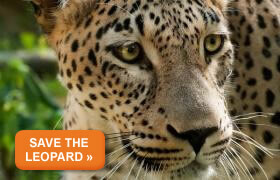 You can support Armenian rangers by donating to Keepers of the Wild.